Iowa caucus results: The race is really, really tight. 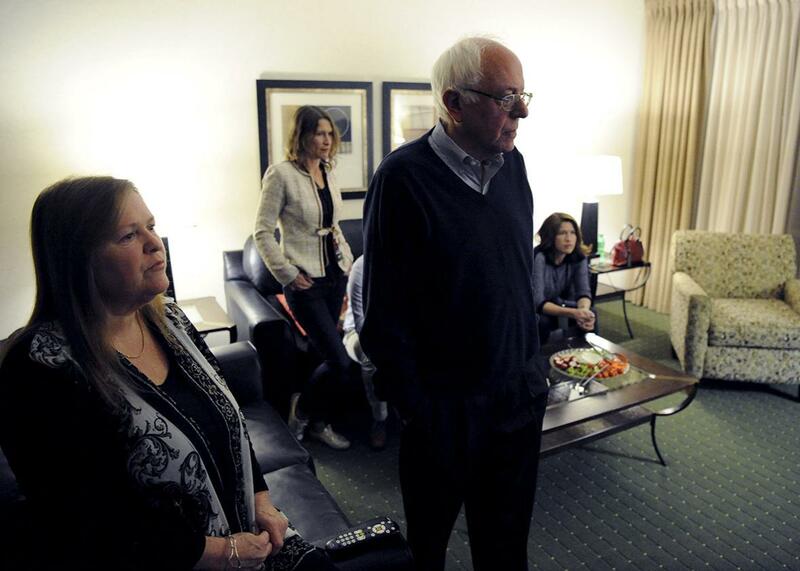 Bernie Sanders and his family watch initial results of the Iowa caucuses on television from a hotel room in Des Moines, Iowa on Feb. 1, 2016. Update, Feb. 2, 2016, 12:20 a.m. ET: It looks like we might not get an Iowa result one way or the other on the Democratic side tonight, so we’re closing up shop here. If you want to check out Slate’s coverage of that result—a “virtual tie” as Bernie Sanders called it—you can see our write-up of that outcome over here. Update, Feb. 1, 2016, 10:45 p.m. ET: Ted Cruz has won the Iowa caucus and Donald Trump has lost it, CNN and the AP are projecting. With 99 percent of the caucus sites reporting according to CNN, Cruz leads with 28 percent of the vote to 24 percent for Trump and 23 percent for Florida Sen. Marco Rubio. You can read more about that result on Slate’s GOP results write-up over here. Mike Huckabee, the winner of the 2008 Iowa caucus, is reportedly suspending his campaign. CNN’s projection had him in ninth place with 2 percent of the vote. Update, Feb. 1, 2016, 10:15 p.m. ET: Martin O’Malley, who is now up to 1 percent in the early returns in Monday’s Iowa caucus with 70 percent reporting, is going to suspend his campaign, CNN is saying. Martin O'Malley will suspend his campaign at his caucus party tonight at Wooly's in Des Moines, per sources close to the campaign. Struggling to think of something here… Oh yeah, there were all those glamour shots! And the time the Wall Street Journal pretend to be like 99.99 percent of America and not to know who he was. The fact that this is how his campaign will be remembered—if it is at all—speaks to O’Malley’s inspiring generic white moderate guy blandness, and the amount of appeal that approach has among Democratic voters today. Update, Feb. 1, 2016, 9:50 p.m. ET: Bernie Sanders has made up some ground on Hillary Clinton, closing the gap to 51 percent to 49 percent with 69 percent of caucus sites reporting. Poor old Martin O’Malley is still at just over 0 percent. On the Republican side, Ted Cruz’s lead has held steady with 28 percent of the vote to Donald Trump’s 25 percent and Marco Rubio’s 22 percent, and 62 percent of the caucus sites reporting. It’s still too early to come up with conclusions from these numbers, but if they hold up it would appear to be a damning indictment of Trump’s last-minute decision to skip last week’s final Republican debate before the caucuses, hosted by Fox News, and hold a rally and veterans benefit instead. Or possibly it’s an indication that Trump’s polling support doesn’t quite translate when actual voting and caucusing begins. Trump held between a 4 and 8-point lead over Cruz in the last five major polls taken at least in part before the debates. His lead over Cruz, though, shrunk to 1 point in the only two surveys taken entirely after the debate, as included by RealClearPolitics in its running polling average. Original post: With early returns having come in on Monday night, Hillary Clinton held a slight edge over Vermont Sen. Bernie Sanders in the Democratic Iowa caucus, but the race remained too close to call. CNN reported that Clinton led 51 percent to 48 percent with 42 percent of the caucus sites reporting, with former Maryland Gov. Martin O’Malley polling at just above 0 percent. On the Republican side, Ted Cruz held a very early preliminary lead of 30 percent to 27 percent for Donald Trump with only 22 percent of the returns in. Marco Rubio was sitting in third with 19 percent of the early vote. CNN’s exit polling appeared to paint a positive picture for Cruz, though, with the Texas senator holding a lead of 30 percent to 23 percent over Trump among self-declared evangelical or born-again Christian voters, and Rubio holding his own with 21 percent of that demographic. The network reported that among the early caucus goers in the exit polls, these evangelical voters made up 63 percent of Republican Iowa caucus voters. In slightly worse news for Cruz, Trump was leading among non-evangelicals with 30 percent of the vote to 24 percent for Rubio and 17 percent for Cruz.